SECRETFORTS: Typewriter meets Freeway: Ed Ruscha, Royal Road Test, 1967. 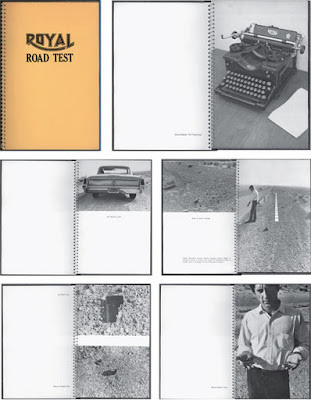 Typewriter meets Freeway: Ed Ruscha, Royal Road Test, 1967. "Book made in collaboration between Ed Ruscha, Mason Williams & Patrick Blackwell. 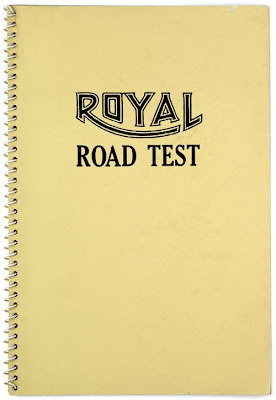 Royal Road Test is a picture-book story of a Royal manual typewriter that was thrown out of the window of a 1963 Buick traveling at ninety miles per hour. Ruscha is cast in the role of the driver, Blackwell the photographer, and Williams the "thrower". 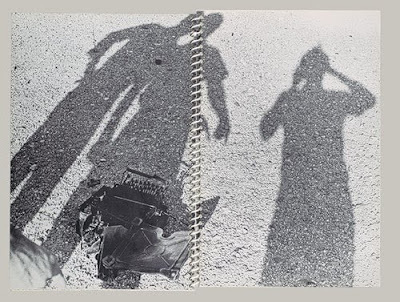 The core of the book is a photographic examination of the wreckage of the typewriter strewn over many square yards, spoofing the methods of an investigator analyzing the demise of an automobile prototype."